Monday and Tuesday called for layering up again, but not to the degree of what some of you guys are experiencing. However, it did snow in parts of Texas, just not our part. Hang in there ladies, spring is just around the corner. Speaking of spring, I think one of the most important pieces to own for the upcoming season is a solid, lighter weight jacket or blazer. The mornings and evenings in March/April tend to be cooler than the daytime temps and it's nice to have a basic topper for dresses and tops. 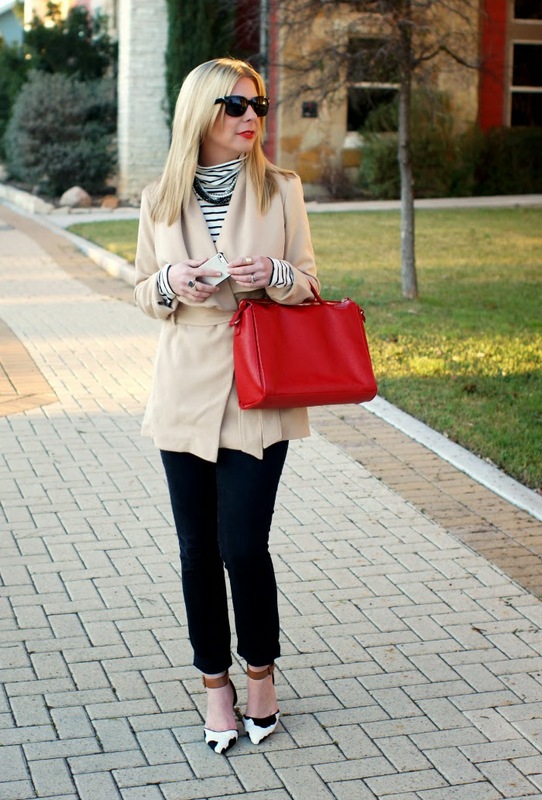 Plus, they can transform simple outfits into a more polished and put together style. 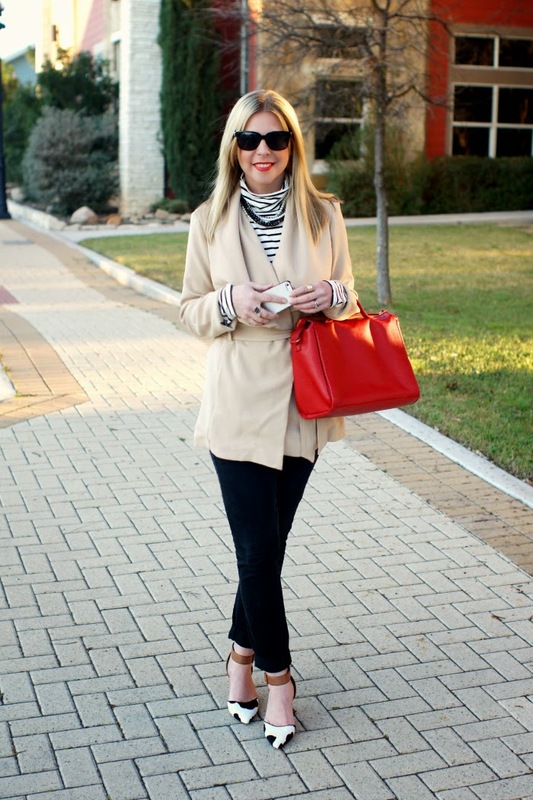 This belted coat is one of my favorite items that I added to my closet earlier this year. It comes in two other colors and is a versatile piece that has taken me from a dressier look (seen here) to a more casual, weekday style. In case you're wondering about these Sam Edelman pumps... I looked EVERYWHERE to try and find them for y'all. Believe me, I wanted to share the glorious goods that I discovered at DSW and crazy steal of a deal. Unfortunately, I couldn't find them anywhere online. You may want to check your local DSW to see if they have them. BUT, I did come across the exact style in different colors and patterns. If you are looking for a lower heel shoe, the Sam Edelman Okala design is for you. I am still thinking about going back and getting the leopard print. They're that good! 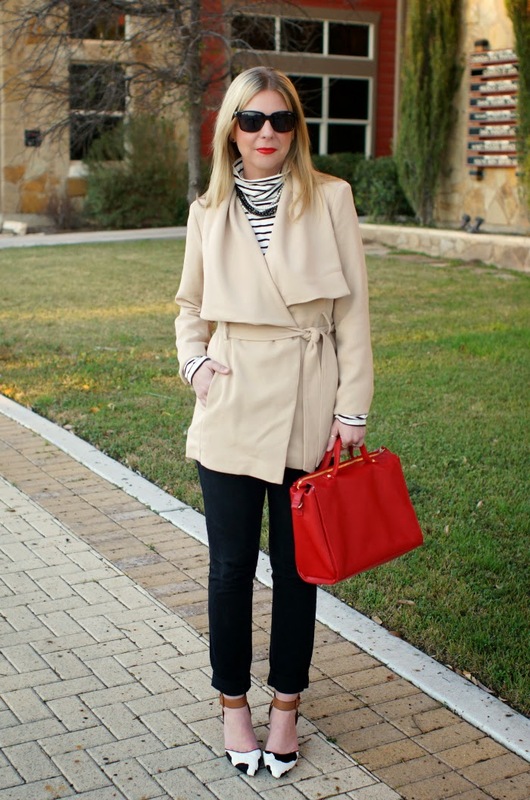 Here is another way I styled this coat.